If you put a huge amount of effort into ensuring shentongroup standby generator orders are processed flawlessly, resulting in very satisfied customers, the chances are that your name is Roy Taylor, and for this reason and more, you’re shentongroup’s Colleague of the Month. Working as a shentongroup Standby Generator Sales & Technical Expert, Roy was also selected by his colleagues for supporting them whilst they were on holiday and for providing motivation to help others succeed in their role, enabling them to hit their targets. Roy is pictured receiving his complimentary bottle of champagne from shentongroup Sales and Marketing Director, Curtis Meek. 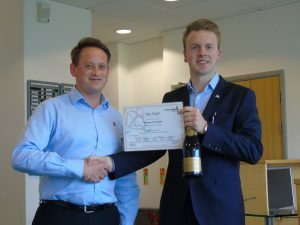 Along with his bubbly, Roy wins £50 worth of vouchers and a certificate, as well as the sole usage of the esteemed Colleague of the Month parking space at Shenton House. From the entire shentongroup team, Roy, thank you and congratulations. If you’d like to speak to a member of the UK’s Leading Technical Experts in Standby Power, Uninterruptible Power Supplies and Combined Heat & Power Systems, then click here now!